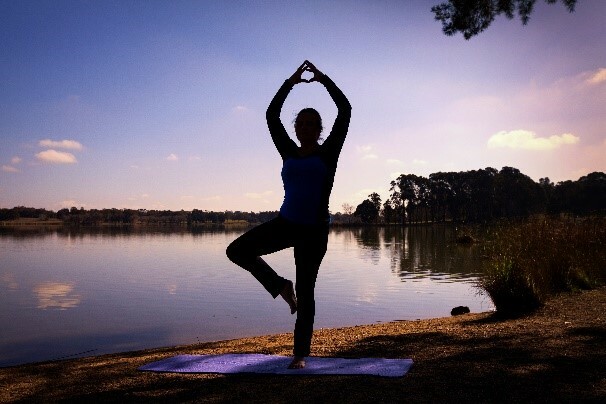 Dru Yoga instructor in Canberra for Dru Yoga classes. Dru Yoga is a Heart-centered yoga that enables significant improvement in general peace of mind, health, wellbeing and happiness. "Dru Yoga is a graceful and potent form of Yoga, based on soft flowing movements, (postures), directed breathing and visualisation"
It is suitable for all ages, fitness levels, body shapes and abilities, leaving participants feeling revitalised, strong, calm and refreshed. See http://www.dru.com.au/dru-yoga for more information and research. Kylie is an approachable, engaging, and empowering Dru Yoga instructor. To find out more about Dru Yoga Contact Kylie. Particular sequences and postures from Dru Yoga can be used to help alleviate stress. With the directed breathing techniques, visualisations and deep relaxation in Dru Yoga, peace of mind can be easily obtained. With its gentle flowing sequences, Dru Yoga can remove blockages in the body's spine and energy system, which in turn can remove the symptoms of pain. Particularly back pain. The activations, sequences and postures in Dru Yoga encourage flexibility and strength. With an emphasis on directed breathing during each flowing sequence, and with visualisation and meditation, Dru Yoga can enable a considerably heightened level of mindfulness. Dru Yoga releases blockages in the body and clears the channels in the spine and other systems of the body, generating energy and vitality. Deep relaxation during a Dru yoga or Reiki session, can promote feelings of vitality and rejuvenation. Alleviate insomnia using the potent combination of simple Dru Yoga postures and Reiki. Alleviate symptoms of anxiety and depression through the powerful combination of Dru Yoga and Reiki. For Bookings or to find out more about Dru Yoga Contact Kylie. Kylie Blacksell is a Registered Dru Yoga Teacher and is a Member of the Dru Professional Network DPN.